Chapter One in the West Village asks you not to judge a book --- or in this case, a restaurant --- by its cover. Even though one of the operating partners is Irish, there's no connection to the acclaimed restaurant of the same name in Dublin. This Chapter One serves New American fare with a blend of both Western European and southern American flair. Chapter One, 33 Greenwich Ave., New York, NY 10014, 212-842-9146. Bacchanal, a new restaurant on the Bowery from former Veritas chef Scott Bryan, focuses on French and Italian cuisine. Naren Young from nearby Saxon + Parole is in charge of the cocktail program. Bacchanal, 146 Bowery, New York, NY 10013, 646-355-1840. Justin Hilbert, the erstwhile chef at Williamsburg's Gwynnett St., is the toque at new West Village eatery Blenheim. The focus of the 45-seat restaurant is seasonal, new American fare. Blenheim, 283 W. 12th St., New York, NY 10014, 212-243-7073. Miss Lily's, the Jamaican joint on W. Houston St., has opened up an eastside outlet. Located on Ave. A and E. 7th St., Miss Lily's 7A Cafe serves up an array of Caribbean delights, including jerk chicken and roasted pork shoulder. Miss Lily's 7A Cafe, 109 Ave. A, New York, NY 10009, 212-812-1482. Andrew Carmellini's latest, Bar Primi, opens in the spot on the Bowery that formerly housed hipster Southern place Peels. The menu, as the restaurant’s name suggests, is comprised of Italian antipasti, pasta and small plates. Bar Primi, 325 Bowery, New York, NY 10003, 212-220-9100. Horchata, a Mexican restaurant in the West Village, offers the usual variety of fare: guacamole, variations on the theme of the enchilada and, of course, margaritas. There are also cocktails spiked with the namesake beverage, horchata. Horchata, 470 Sixth Ave., New York, NY 10011, 212-243-8226. Around the corner from the 100-year-old Jewish eating institution Russ & Daughters comes Russ & Daughters Cafe, an informal spot serving up caviar, knishes, herring and other delights. Russ & Daughters Cafe, 127 Orchard St., New York, NY 10002, 212-475-4881. The much-anticipated restaurant from Ivan Orkin, ramen-maker extraordinaire, has opened. Ivan Ramen, set on the Lower East Side, serves up the Japanese noodle soup in a few different varieties. Ivan Ramen, 25 Clinton St., New York, NY 10002, 646-678-3859. Le Cirque Cafe presents Musical Mondays, featuring live jazz music on June 9, 16, 23 & 30. The shows will be held from 7:30 p.m.-10:30 p.m. No cover fee. Guests can also take advantage of the $38 prix-fixe dinner menu. For reservations, please call 212-644-0202. Le Cirque Cafe, One Beacon Court, 151 E. 58th St., New York, NY 10022, 212-644-0202. L'Atelier de Joël Robuchon shut down in Four Seasons Hotel New York, but the namesake chef plans to revive the restaurant on Fifth Avenue and 47th Street sometime later this year. It has been reported that Jean-Georges Vongerichten will open his third restaurant in ABC Carpet & Home. After the success of ABC Kitchen and ABC Cocina, his next venture will be a vegetarian restaurant. It is scheduled to open sometime this summer. ABC Kitchen, ABC Carpet & Home, 35 E. 18th St. , New York, NY 10003, 212-475-5829. The latest creation in Umami Burger’s “Artist Series” is the José Andrés Burger, a ground pork and cured ham patty topped with piquillo pepper confit, caramelized onions and Manchego cheese. It costs $15, with $1 from each burger donated to World Central Kitchen, a humanitarian organization launched by José Andrés and focused on solutions to hunger and poverty. Andrés has also designed a tapas and pintxos menu with options like patatas bravas (twice cooked crispy potatoes), dates wrapped with ham, and green olives with piquillo confit and anchovy. For more information, visit www.umami.com. 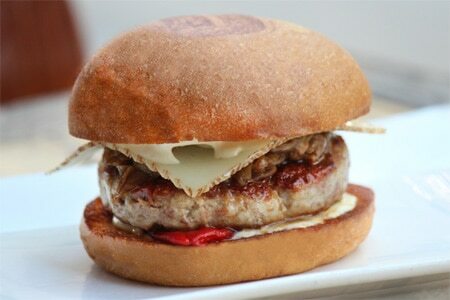 Umami Burger, 432 Sixth Ave., New York, NY 10011, 212-677-8626. Until chef Danny Bowien finds a new location for his hot-spot San Francisco import Mission Chinese Food, he'll be doing pop-ups at Frankies 457 Spuntino in Brooklyn. These are the dates when Frankies will be Mission Chinese Food: May 19-21 and 26-28; June 2-4, 9, 11, 16-18, 23 and 25. Frankies 457 Spuntino, 457 Court St., Brooklyn, NY 11231, 718-403-0033. The Spotted Pig, the West Village gastropub that is notorious for its long waits and no reservations policy, is taking reservations. But just for a couple weeks --- from May 20 to June 2 --- in honor of its ten-year anniversary. The Spotted Pig, 314 W. 11th St., New York, NY 10014, 212-620-0393. Huertas, the new Basque-accented eatery in the East Village, has begun a "Cans & Conservas" program: for $12, the diner gets a can of beer and a can, or "conservas," of fish. Huertas, 107 First Ave., New York, NY 10003, 212-228-4490. Now you can have your Sushi Nakazawa on Sundays and eat it, too. That's right. The new West Village sushi spot, which has been closed on Sundays, is now open seven nights a week. Sushi Nakazawa, 23 Commerce St., New York, NY 10014, 212-924-2212. Pok Pok NY has announced that it's opening for breakfast daily. The new breakfast menu of this popular Thai restaurant includes steamed buns and various "grab 'n' go" options. Coffee is from Stumptown. Pok Pok NY, 117 Columbia St., Brooklyn, NY 11231, 718-923-9322. 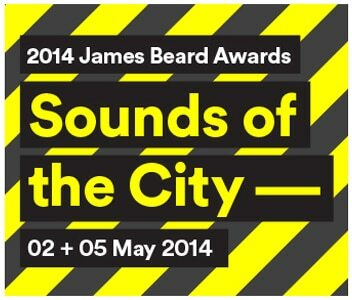 The 2014 James Beard Foundation Awards have been announced. New York winners include Dominique Ansel for Outstanding Pastry Chef and April Bloomfield of The Spotted Pig for Best Chef: New York City. Dominique Ansel Bakery, 189 Spring St., New York, NY 10012, 212-219-2773. Find out which chefs, restaurants and other culinary professionals were honored at the 2014 James Beard Foundation Awards at Lincoln Center in New York. Read GAYOT's coverage of the annual awards ceremony. 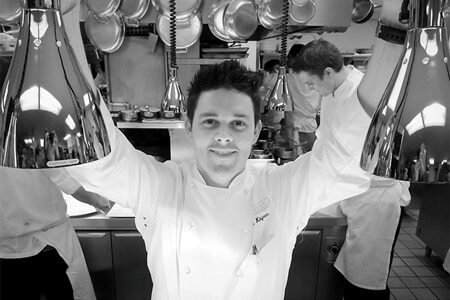 Chef Gavin Kaysen's last day of service at New York's Café Boulud was May 31, 2014. He will open a restaurant called Merchant in Minneapolis. Café Boulud's chef de cuisine, Aaron Bludorn, will take over for Kaysen. Café Boulud, The Surrey, 20 E. 76th St., New York, NY 10021, 212-772-2600. Peter Cho, who worked his way up in the kitchen at The Breslin Bar & Dining Room (and also logged time at Salvation Taco), has left to return to his hometown Portland, Oregon, to start a Korean restaurant serving wood-fired fare. The Breslin Bar & Dining Room, Ace Hotel New York, 16 W. 29th St., New York, NY 10001, 212-679-1939. Jonathan Wright has been named the chef of the Rainbow Room, the iconic restaurant atop 30 Rockefeller Center that closed 2009 and will reopen in October 2014. Chef Wright previously worked at Le Manoir aux Quat'Saisons in the UK and at Sandy Lane hotel in Barbados. Rainbow Room, Rockefeller Center, 30 Rockefeller Plaza, 65th Fl., New York, NY 10112, no phone. Japadog, the Vancouver export that had set up shop on St. Marks Place in the East Village, has closed. Japadog, 30 St. Marks Pl., New York, NY 10003, no phone. Gallery at Villard Michel Richard has temporarily closed for the summer 2014 season. Gallery at Villard Michel Richard, The New York Palace, 455 Madison Ave., New York, NY 10022, 212-891-8100. After just three weeks, Après, located in the former home of Apiary, has shut down. A new branch of Unidentified Flying Chicken (aka UFC) will open up in the space. Après, 60 Third Ave., New York, NY 10003, no phone. San Marzano, the Lower East Side pizza spot, has shut down. San Marzano, 71 Clinton St., New York, NY 10002, no phone. After just seven weeks in business, Meatpacking District restaurant La Cenita Steak has turned off its burners. The owners are turning it into an events space. La Cenita Steak, 409 W. 14th St., New York, NY 10014, no phone. Sorella, the Lower East Side Italian spot run by chef Emma Hearst and Sarah Krathen, has shut down. There's no word yet on what the duo will do next. Sorella, 95 Allen St., New York, NY 10002, no phone. ReBar, the gastropub in Brooklyn's Dumbo neighborhood, has shut down. ReBar, 147 Front St., New York, NY 11201, no phone.